Do you have an extra chair at your table?I could use one. There are a lot of people that could use one. They are waiting for an invite from you, especially at Christmas time. And yet, so many circles are closed. So many tables are closed. Would you open your table? Is there an extra chair at your table? One of my favourite stories in the Bible is about Mephibosheth (2 Samuel 9). I invite you to try and imagine what Mephibosheth felt like, because I’m guessing you’ve been there a time or two. I know I have. Mephibosheth felt unworthy, not good enough. Mephibosheth figured others thought of him as “good for nothing.” He was from, quite literally, no place (Lo Debar). 30 km beyond the middle of nowhere. (I know some of us Atlantic Canadians can relate to that!) He was left out of temple (a.k.a. – church) activities because he wasn’t consider good enough (he was consider “unclean” by the religious institution). He was scraping his own life by, it was ok, but it was not easy. His name literally means dispeller of shame. You could smell his shame a mile away. He knew, just knew, he didn’t fit with others. He refers to himself as a “dead dog”, that is a stray dog, left out in the tough world to fend for himself he figured he was as good as dead. And Mephibosheth certainly didn’t feel welcome at your table and mine. He most certainly didn’t feel welcome at a King’s table. You ever feel like that? Not welcome. Not wanted. Not quite good enough or cool enough or “something” enough. Not quite like the others. No room for you at the table. Remember that feeling? I do. That’s Mephibosheth. And yes, let your mind go to the refugee, the stranger, the poor, the person of a different religion then you, the person of a different race then you (this list could go on) and how they may feel that there is no room at the table for them. That too is Mephibosheth. And yet, another character is in the story, King David. And King David chooses to invite, welcome and fully embrace Mephibosheth to his table and into his family. Mephibosheth - crutches and all, shame and all, loneliness and all, insecurities and all - is invited to the King’s table! That’s powerful. To go from feeling not wanted, unwelcome, a nuisance, a bother… To being embraced at the King’s table. Nice! I want that. I want others to experience that. I want others to experience that through me. Too often I’ve given off a different vibe of “not welcome”, “not one of my kind.” Too often church circles give off this vibe - "you are not one of us." What made it so seemingly easy for David to extend such deep hospitality? I have a hunch about David. A hunch that David so freely gave this kind of welcome to Mephibosheth because David had tasted this kind of welcome from the Lord. See this same David had written down in poetry “You (God) prepare a table before me in the presence of my enemies. You anoint my head with oil; my cup overflows.” (Psalm 23:5) David had experienced what it is like to be welcomed to God’s table. “You (God) prepare a table before me in the presence of my enemies” It was a place of safety. In the ancient world, if you were enjoying hospitality at someone’s table it was like yelling “home free.” While you were enjoying hospitality at someone’s table the tax collector couldn’t come after you, your enemy couldn’t come and lay a hand on you, that person to whom you owed a debt couldn’t come and bug you about it, you were home free. You were safe. Safe to enjoy the company around you. Safe to be real. Safe to express your struggles and worries and know that no one would come after you or criticize you. David had experienced this from the Lord. In the Lord’s presence we are safe. Safe to be real. “You anoint my head oil” Oil throughout Scripture is a symbol of God’s presence, His setting aside someone for something special. God has something special for you. Oil is also seen as a symbol of joy, overwhelming joy. God is overjoyed you are at His table. He takes delight in you, delights in you sharing your heart and shares His heart with you. David had experienced this joy from the Lord. In the Lord’s presence there is joy and delight. “My cup overflows” Another tradition from the ancient world was around the cups on the table. If your host stopped filling up your cup it was their way of signalling to you that it was time to skedaddle, you’d out-stayed your welcome. However, if your host kept filling up your cup, it was their way of saying to you, “You are welcome to stay longer. Please stay longer, I am so enjoying your company.” And well, if the host filled your cup to overflowing that was a whole other story, stating “Please stay forever! I will keep providing for you. I am so enjoying your company.” David had experienced this from the Lord, a welcome that does not go away. In the Lord’s presence we are welcome to stay forever. David had tasted what it’s like to be at God’s table, a place of safety, joy and a welcome that doesn’t go away. And what does David do? He turns around and gives this same safety, joy and welcome to others. He wants others to taste what it is like to experience God’s presence through him. He wants others to taste what it is like at God’s table through his table. How about you? Will you let others get a taste of God’s safety, God’s joy, God’s welcome through your tables? God is using ordinary kitchen tables, picnic tables, Tim Horton’s tables, caf tables, and circles all over to welcome people to His table. I’m not talking about inviting people into your circle so you can preach to them. I’m not talking about inviting people into your circle so you can “give them the Gospel.” I'm not talking about inviting people into your circle so you can "set them right." I am talking about inviting people into your circle to give them safety, joy and a deep welcome. Trusting God for what He’ll do with your table. I am talking about inviting people into your circle to get to know them. I am talking about, trusting Christ is living in you and through you, get into some new circles. I am talking about getting to know and value people, especially those who have been outside your circle. Create a table of safety, joy and a deep welcome. How? Simply create safety, joy and welcome in your circles. Safety – listen non-judgmentally Joy – delight in who the person is today, not who you think they should be or could be Welcome – intentionally set aside time to linger. Lay aside other things to give your attention to those around the table, linger around the table, linger in the conversations, linger in the storytelling, linger in asking deeper questions, linger. 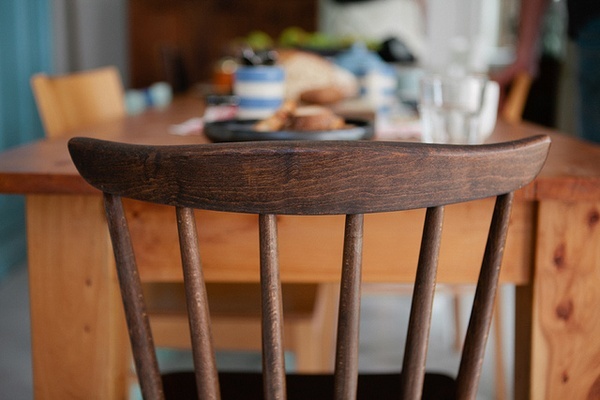 Is there an empty chair at your table for Mephibosheth? Is there an empty chair for those that are feeling like stray dogs in our world today? Is there an empty chair for those who are getting treated like stray dogs? Is there an empty chair at your table for me? Let me push this a little further. Why is your table closed? Sit with this question for a while. Examine the excuses that come into your head. How can your excuses/reasons be overcome? What fear do you have? If you say your table is not closed – are you sure? How often do you learn from others that are different than you? Where are you building genuine friendships outside those that are “like you”? What’s one step you could take this season to open up your circle a little more? Not as a drive-by task to fulfill on your list, but as a genuine extending of a welcome. 2. Go to a soup kitchen, to sit around the tables and hear stories and share stories, to genuinely get to know people. 4. Buy a refugee or newcomer to your community a bus pass and travel with them to help them get to know their regular routes. 5. Share and donate clothes, furniture, toys and time and get to know those working where you offer these items. 6. Give to those supporting the arriving refugees. Take time to understand the situation refugees are facing. Listen to their stories. 7. Reopen your small group/Bible Study/LifeGroup or Youth Group for new people to join. Specifically invite someone to join you. I’m sure you’ve got many more ideas. Please share. Who needs a welcome at our tables? How do we welcome them? Add your ideas to the comments. May our tables be places where people taste the Lord’s safety, joy and deep welcome. May God use our tables to transform our neighbourhoods.